cousin xenia coming to town! Originally uploaded by Xenia Petrovna. my cousin xenia (the one in jeans) is in med school in grenada and she's coming to visit for New Year's -- but this time with a special treat -- her brother victor. he's 22, so he can come to all the parties so i hope my guy geek friends can show him how we roll here in SF. he lives in fairfax, va -- not exactly the fun/youth/geekness capital of the world. 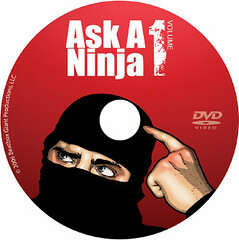 what more could you want for any present other than the first ever Ask A Ninja dvd compilation? 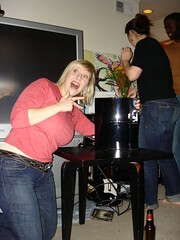 someone i know stood in line for a playstation 3 and didnt pee for 10 hours. it was a man. Originally uploaded by the haighter.